Summary : From the same director and producer Condor Heroes 2007 and Legend of Arching Heroes. 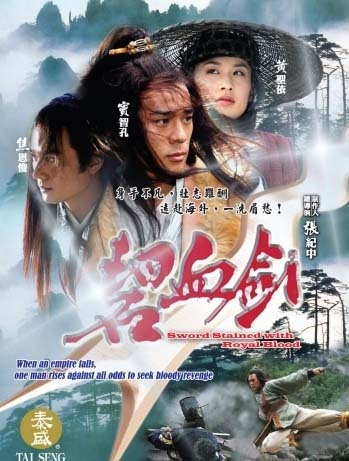 Swordplay novels by Jin Yong (aka Louis Cha) have been adapted into numerous TV series and films. Sword Stained With Royal Blood is no exception. Mainland Chinese director Zhang Jichong, after turning a few Jin Yong novels into well-received TV series, adapts Sword Stained With Royal Blood into an intriguing swordplay drama, with more historical elements added compared to previous versions. Singer/actor Bobby Dou stars as Yuan Chengzhi, son of a general who has been killed by the emperor. He comes across a beautiful girl named Qingqing, portrayed by Eva Huang from Kungfu Hustle, and they embark on exciting adventures together, with Yuan still bearing in mind his desire to revenge his father's death. On his journey, he befriends another girl, Jiu, but it is only after they have formed a close relationship that she reveals her real identity as the royal princess, daughter of the emperor who killed Yuan's father. "The fighting scenes are really worth watching and the character portrayed by Bobby Dou and Eva Huang as Yuan and Qingqing is to me the perfect pair and I wait eagerly for the remaining episodes." "I just finished watching this show, and I have to say it was quite addicting. The story itself is nothing original, I mean, more or less same stories about a young hero doing his best to protect his country and avenging the death of his father. But the actors did a good job, and the fighting/action was amazing. I highly recommend this show for those lazy lazy afternoons or a long holiday weekend. Eva Huang was super cute and Bobby Dou has amazing eyes. It's an entertaining piece for sure."